Nothing says CONGRATS better than a gift that says CONGRATS on it! 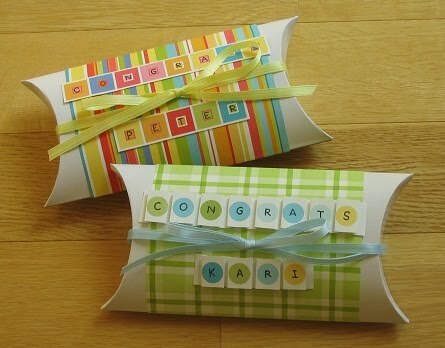 I made these for two cousins when they graduated from college. ﻿﻿Guess what fits in pillowboxes really well... gift cards! This is a really easy 5-minute craft. 1. Start with a pillowbox - you can buy them bulk at OrientalTrading.com. 2. Measure the width of the box and cut out a piece of decorative scrapbooking paper that is longer than twice the width of the box and not quite as wide as the box. 3. Wrap the paper around the box and secure with double-stick tape. 5. 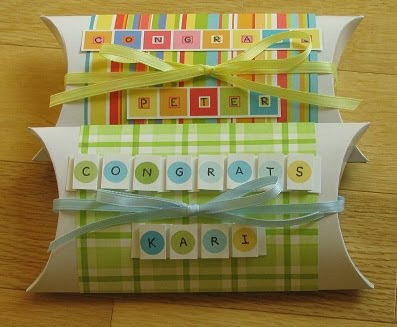 Insert a small gift, like a gift card or money and fold over the ends. 6. Tie a decorative ribbon to secure it.